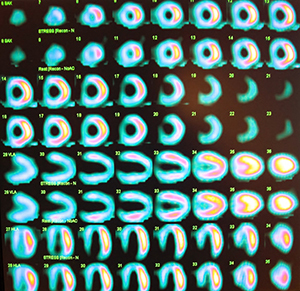 A nuclear stress test is an imaging study which takes pictures of the heart muscle when it is at rest and after it has been stressed from exercise. A radioactive isotope (called Myoview or Cardiolite) is injected into the blood stream and travels through the heart arteries, which allows the nuclear camera (or gamma camera) to capture images of the heart muscle. The heart is exercised by the patient walking on a treadmill. If the patient is unable to exercise on the treadmill, a medicine called Regadenoson (Lexiscan) or Dobutamine will be used to make the heart muscle beat faster as if the patient were exercising. An I.V. will be placed in the arm vein and a technologist will inject the radioactive isotope into the I.V. approximately 30 minutes after the injection, the patient’s chest is scanned under the gamma camera which takes pictures of the heart. During the scanning, the patient will lay on a scanner table with arms placed above the head. The pictures take about 15 minutes. After the pictures have been taken, the patient will either walk on the treadmill or receive Regadenoson (Lexiscan) or Dobutamine to exercise the heart muscle. During the stress portion of the test, the patient is injected with a second dose of isotope through the I.V. The patient then has the second set of pictures taken under the gamma camera which captures the images of the heart after exercising. If the test is normal during both exercise and rest, then blood flow through the coronary arteries is normal. The coronary arteries supply blood to the heart muscle. If the test shows that perfusion (blood flow) is normal during rest but not during exercise (a perfusion defect), then the heart isn’t getting enough blood when it must work harder than normal. This may be due to a blockage in one or more coronary arteries. If the test is abnormal during both exercise and rest, there is limited blood flow to that part of the heart at all times. It is very important that you arrive on time for your test. The isotopes ordered for each patient are different depending on the required dose for that patient. The isotope loses its properties quickly, so if you are late for your study you may be asked to reschedule if the isotope can no longer be used.